Card payments online are growing at double digit rates and will continue to increase significantly faster than card spending at physical outlets to account for nearly a quarter of all card expenditure by 2023. New research analyses the role that payment cards are playing in the e-commerce sector and the impact growth in e-commerce is having on use of cards in traditional outlets. According to the analysis, e-commerce expenditure amounted to $4.5 trillion in 2017, up 13% since 2016. The main drivers of this growth are increased convenience when compared to buying from bricks and mortar outlets and, in some cases, lower prices. The forecast shows that e-commerce expenditure will increase to $ 11 trillion in 2023. “As consumers increasingly migrate from physical outlets to digital channels, smartphone ownership rises further and mobile payment apps become more and more sophisticated, e-commerce will see significant further growth,” says Daniel Dawson, who led RBR’s research project. In addition, new means of enhancing security will allay consumers’ concerns about the risk of fraud. 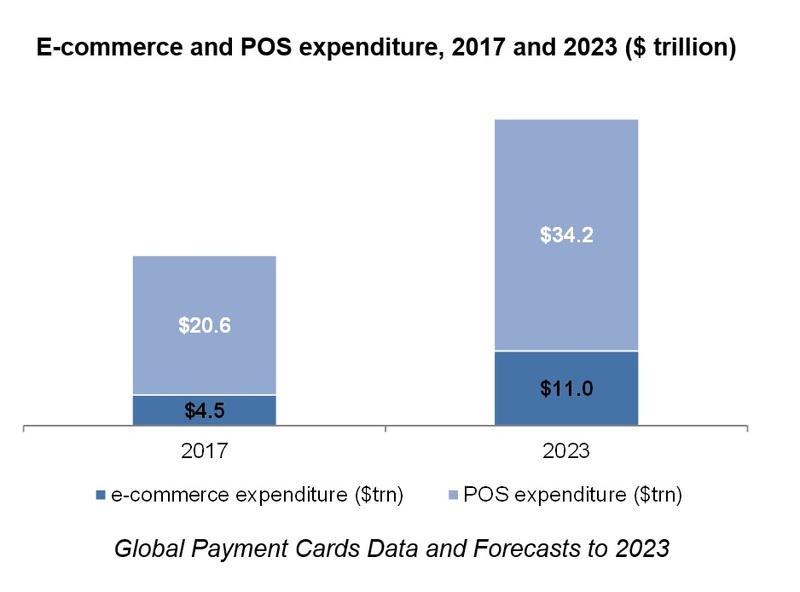 By 2023, e-commerce is forecast to account for 24% of card expenditure, compared to 18% in 2017. The research highlights numerous factors which are driving growth in e-commerce, many of which vary between countries. For example, in the UK, retailer campaigns such as Black Friday and Cyber Monday have caused a migration away from the high street, while in Ukraine, which accounts for 10% of central and eastern Europe’s e‑commerce expenditure, customers are using online shopping as a way of reducing costs in a challenging economic environment.